Now I loved "Josie and the Pussycats," but somewhere along the line (1972-73) came "Josie and the Pussycats IN OUTER SPACE." "This version of the series launched the characters into outer space; the opening credits sequence shows Alexandra accidentally knocking the cast into a spaceship and launching it into deep space. Every episode centered on the Pussycats encountering a strange new world, where they would encounter and often be kidnapped by various alien races before escaping and attempting to return home. Musical numbers and chase sequences set to newly recorded songs were featured in this spin-off series as with the original. Josie in Outer Space also added the character of Bleep, a pet-sized fluffy alien adopted by Melody, who was the only one who could understand the creature (who only says "Bleep") and numerous other alien animals encountered." I also love this: For "Josie" and some other shows, Hanna-Barbera cheaped out on the laugh track! Did you notice this? "Early in 1971, Hanna-Barbera opted not to pay for [CBS sound engineer and laugh-track pioneer[ Charley Douglass’s services. Pre-1971 hits like Scooby-Doo, Where Are You!, Harlem Globetrotters, and Josie and the Pussycats employed a laugh track, but Hanna-Barbera looked for any chance to cut costs. As a result, instead of utilizing a full laugh track, a sound engineer at the Hanna-Barbera studios isolated approximately half a dozen canned chuckles from Douglass’ vast library. Mixed with a tinny, metallic sound to it, there were approximately five mild laughs, plus one or two uncontrollable belly-laughs (one contains an audible woman laughing at the tail end). This limited laugh track did not contain any looping tapes with 10 assorted laughs per tape, no endless variety of chuckles and no titter track. When audience reaction was needed, the limited laughs were dubbed repeatedly. On occasion, two or three of the chuckles were combined to give the effect that there was more diversity to the already limited laugh track. This laugh track—containing less than 10 snippets of laughter—would be used incessantly for exactly a decade. Critics took note of the inferior sounding laugh track permeating Hanna-Barbera's Saturday morning fare. The same prerecorded laugh can be heard after nearly every punchline. The fact that the treble was mixed far too high for the soundtrack it accompanies only drew attention to the falsity of the practice." Eh, them kids'll never notice, I imagine them saying. And they were right -- I never did. Did you? 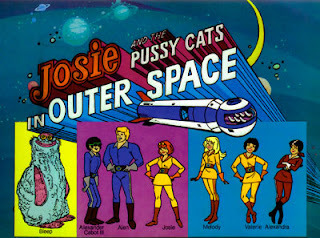 Did you watch the outer space Pussycats, or just the regular ones? You gotta read the laugh track entry. "It was believed that the absence of guffaws meant American viewers could not tell if the particular show was indeed a comedy" Also, I love how certain people insisted on no laugh track -- you showed 'em, Charles Schulz.